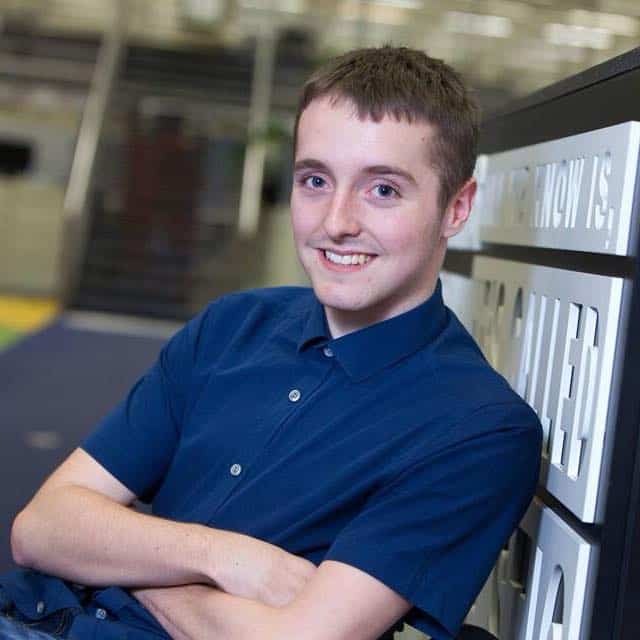 In our latest Disabled Entrepreneurs-inspired industry spotlight, we chat to young broadcast journalist, Josh Gardner about his experiences at BBC Radio Leeds, and the challenges he faces each day, working with Transverse Myelitis. S] How did you get into broadcasting? J] I started at college doing Radio Journalism, and that was at Leeds City College, and then from there, in my second year, I went into Radio Leeds for a work experience day with a basketball team that I’d done an interview with. I applied for an apprenticeship that was open to all the local Leeds stations. I applied, and about four weeks later I got an interview and then the day before my 18th birthday I found out that I’d got it! S] How is the apprenticeship – any challenges? J] The first challenge was the application process! When you apply you have to submit this 40 second audio clip about, why you want to work for the BBC, mine basically said that I wanted to make a change, not by me just speaking out and doing public speaking type stuff, but by being a broadcaster. I wanted to be the guy that someone could tell a story to, and then I could get it out in the press. That desire won them over really, because there’s not that many people in the media industry who are willing to talk or go and look for stories that are happening that concern people in wheelchairs, or those with disabilities in general. I have this unique eye for stories and tend to pick up random stuff that other people miss. S] What has been a highlight of your career so far? J] The most recent election night, for me, was just cracking! I’ve interviewed celebrities, and of course I get invited to lots of press events, but there was nothing like being behind the scenes at the election, and seeing all the candidates sweating because they weren’t sure what was going to happen. There was a lot of pressure with the recounts and such – I think if everyone could spend the day in the candidates shoes then everybody would vote. I was the first person to tweet saying that Ed Balls had lost his seat. It was the same more recently with Leeds United and going to a press conference where we didn’t know who was going to end up being the new Leeds manager, and then this guy walks in who’s the new man in charge, and we have to find out everything about him as quickly as possible! So, that was great, but the election has topped it. S] As a wheelchair user how did you first get into basketball? Basketball I got into just after I got in a chair, and that happened to me when I was nine. I got a virus called Transverse Myelitis – it’s usually TM for short. I was paralysed from the neck down, but got a bit of movement back in my legs and arms – from there, I joined the Leeds Spiders team and I’ve always loved it. I’ve never wanted to stop. I just want to do more of it. Work has slowed things down, as if I’ve got to work in an evening, or on a weekend show, then that comes first. I’m actually in the process of completing a coaching course, and that all adds to the excitement of the game for me. What are your main goals for the future? J] I hope that I can keep doing basketball, so that I can keep fit. With journalism, I’d like to still be working in the media; I’m not sure in which area yet, but we’ll see what happens when my contract runs out in December and the apprenticeship ends. S] How would you advise that someone with a disability like yourself approach a career in the media? J] I would just say, don’t take no for an answer! If someone says you can’t do something, you can! I’ve always gone by that, and if someone is looking for someone to cover a story, then I will always do it. If I’ve been at an event or a gig, and there’s been steps to the places that I’ve needed to get to, I’ve crawled up them, or got someone to carry my wheelchair up, or lift me and my chair up! You have to also have confidence, and to be able to give people a reason to hire you over somebody that can walk. They are taking a risk hiring you over someone that can walk. S] What do you say to people if that subject comes up? J] I’ll say that they might be able to use their legs, but it’s likely that I’ve got the keener eye for a story, and more life experience. I’m 18 now, and the things that I’ve done – many people who can walk couldn’t do! Follow Josh on Twitter, or visit his website.